The Commission's priorities for 2019 have been clearly displayed in the Work Programme for 2018-2020, which sets the strategy for the last stage of Horizon 2020. 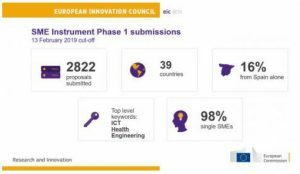 The budget allocated for the European Innovation Council (EIC) pilot competitions, will see a general increase: up to €552.26m for the SME Instrument competition and €247.50m for the Future Emerging Technologies Open competition. The budget for Fast Track to Innovation calls will be kept at €100m. Spain is the EU country with the most successful start-ups in this year’s Phase 1 competition under the SME Instrument, with total of 48 Spanish companies getting funding. Next was Italy, with 21 grants and third France with 18. Cyprus, Malta, Slovakia and Romania had no successful candidates. From 2,149 applicants, the European Commission selected 242 SMEs from 30 countries to receive a total of €12 million, to spend on getting their innovations to market faster. Each winner receives €50,000 to draft a business plan and also gets access to free coaching and business acceleration services. Most companies are in ICT, health and engineering. They are developing various innovations, including a sensory feedback system for phantom pains, a new technology for micro motors, a control system for e-bikes that extends battery life, a distance communication system for drones and a valuation tool for start-ups based on artificial intelligence. The SME Instrument currently is part of EU’s research and innovation programme Horizon 2020, but is due to move under the umbrella of the newly formed European Innovation Council, the Commission’s attempt at creating a one stop shop for innovators across the continent. Companies can apply for two phases under the SME Instrument, depending on the maturity of their innovation. Under Phase 1, each project receives a lump sum of €50,000 to carry out a feasibility study. Under Phase 2, €500,000 to €2.5 million per company is available to finance innovation activities such as demonstration, testing, piloting and scaling up. The next application deadline for the SME Instrument Phase 1 is on 5 September 2018. RedKnight starring at the Mediwales Showcase: a great event! 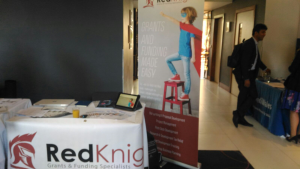 Yesterday, the RedKnight team took part in the last edition of the Mediwales Showcase, a prestigious event that took place at the Novotel in Cardiff. The event was attended by new and important members who showed the public involved their business and their new projects, among which stood out IMSPEX, who also presented the BreathSpec project, displaying a functioning device at their stand. Being a long term Mediwales member, it is always a pleasure to be an active part at these very engaging events and to meet new potential partners and clients. Especially on this occasion, a lot of members invited approached us at our stand and it was incredible to see that there are so many innovative realities in Wales, eager and willing to take on big funding opportunities, and we are happy to having met you all and we enjoyed talking to all of you who stopped by and asked about RedKnight and how we can help you growing your business! We wanted to thank you MediWales for organising the event and we look forward to meeting again all the fantastic people we met yesterday and we hope to meet even more in the future!